This reference work targets researchers who have chosen a career in this complex but essential industry as well as people who are new in the industry and are looking for easy references to the work in which they are involved. This Handbook is an essential addition to the libraries of universities which contain a chemical engineering faculty as well as to the libraries of engineering construction companies, and oil refineries. This Handbook describes and discusses the features that make up the petroleum refining industry. It begins with a description of the crude oils and their nature. It continues with the saleable products from the refining processes, with a review of the modern day environmental impact. There is a complete overview of the processes that make up the refinery with a brief history of the processes. It also describes design technique, operation, and, in the case of catalytic units, the chemistry of the reaction routes. These discussions are supported by calculation procedures and examples, sufficient to enable good input to modern computer simulation packages. The Handbook also covers off-sites and utilities, as well as environmental and safety aspects relevant to the industry. The chapter on refinery planning covers both operational planning and the decision making procedures for new or revamped processes. Finally, the major items of equipment used in the industry are reviewed. This chapter gives a detail of the equipment with examples of the process specifications for these items. The final chapter is in part a glossary and in part a dictionary of the terms and expressions used in Petroleum Refining. This part of the book also includes an appendix section with an item on much used data such as converging factors, selected crude oil assays and an example of optimising a refinery configuration using linear programming. 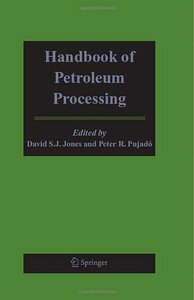 Part 1: Handbook of petroleum processing. An introduction to crude oil and its processing. Petroleum products. – The atmospheric and vacuum crude oil distillation units. – The light end units. – The catalytic reforming process. – The fluid catalytic cracking process. – The distillate hydro cracking process. – The production of gasoline precursors. – The refinery gas treating processes. – The non energy refineries. – The support services common to most refineries. – The refinery environmental issues. Handling hazardous materials and safety. Quality control of refinery products. Refinery planning, economics, and handling new projects. – An introduction to economic analysis. Process equipment in petroleum refining. – Appendices: Examples of working flow sheets. General data. – A selecton of crude oil assays. – An example of an exercies using linear programming.